My first visit to Dip and Flip was on a whim. When they opened back in 2013 they handed out flyers at the nearby Clapham Junction station. Usually suspicious of food establishments that distribute leaflets, I threw caution to the wind and suggested a friend and I check it out for dinner. Boy am I glad that I did. These guys know how to do burgers! The restaurant is decked out with wooden tables similar to lots of other Burger joints dotted around London, and the soft lighting adds to the relaxed and cosy atmosphere. Its quite small with space for no more than about 40 people, but you never feel rushed and the staff are friendly without being overbearing. I ordered a Dip & Flip burger (£9.95), which comes with a beef patty, cheese, coleslaw, a slice of roast beef soaked in gravy and thinly sliced dill pickles, all wrapped up in a soft brioche bun. 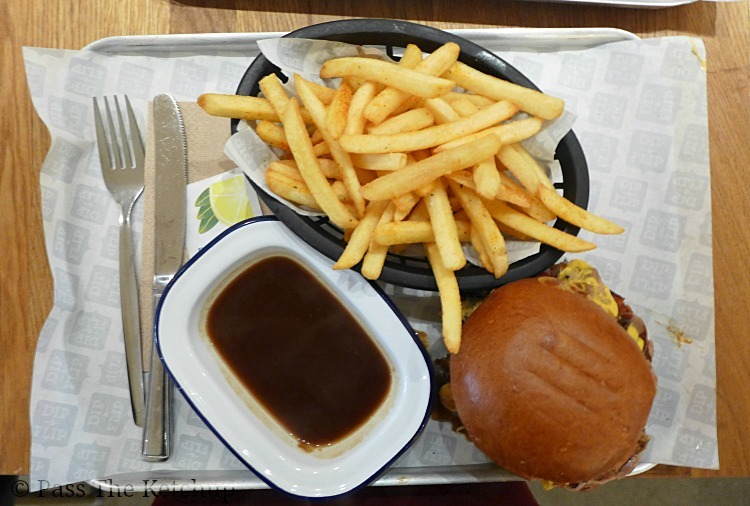 All burgers come with a free side of dipping gravy and I also ordered a side of fries (£2.75). The beef was of a good quality; juicy, well seasoned and the perfect thickness . Burgers are cooked medium unless you request otherwise. The fillings tasted fresh and didn’t overpower the patty. It does get a little messy which is why each table has their own roll of kitchen paper (trust me, you’ll need it). We left positively stuffed and happy. I’ve been back to Dip & Flip several times since my first visit and they’ve been consistently good. 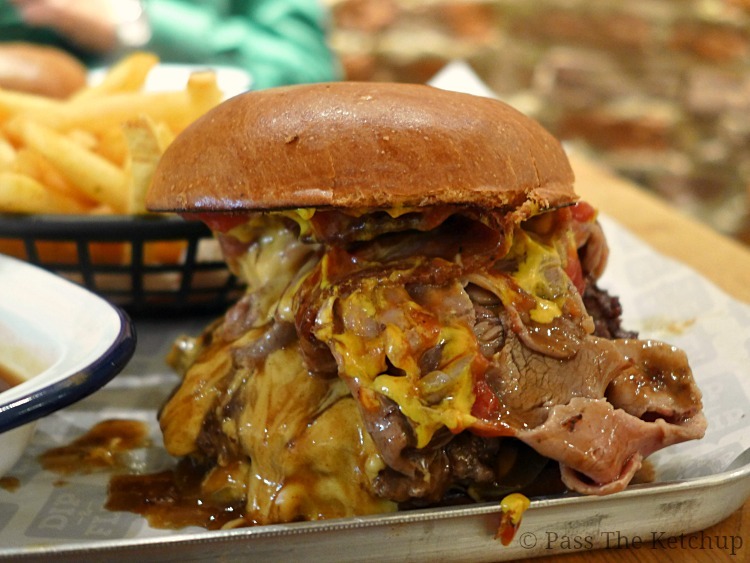 I’ve visited nearly all of the well-known burger joints in London, and Dip & Flip is probably my favourite burger restaurant in London. If you haven’t already been, get yourself down there. If you enjoyed reading this review please click the “thumbs up” button below and let me know your thoughts in the comments!